PRESS RELEASE - Tweet it up a notch! 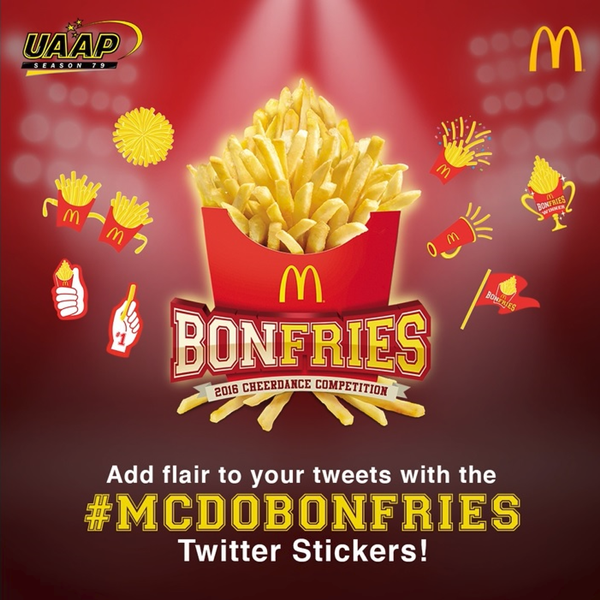 McDonald’s offers a new and exciting reason to tweet friends with #McDoBonFries Twitter Stickers — a set of Promoted Stickers for Twitter users featuring playful takes on an iconic product, the World Famous Fries. McDonald’s partnered with Twitter to be the first in the Asia-Pacific region to launch Promoted Stickers. Take that proud selfie or groufie with schoolmates and decorate it with Fry-themed confetti for a flawless finish; Fry megaphone for a louder cheer; Fry trophy for a winning performance; Fry flaglet for school pride; Fry number 1 sign as a good luck charm; Fry thumbs up for sharing positivity; Fry glasses for confidence; and Fry pompoms for extra cheer! Follow @McDo.PH on Facebook, @McDo_PH on Twitter, @McDo_PH on Instagram or visit www.mcdonalds.com.ph for more information.